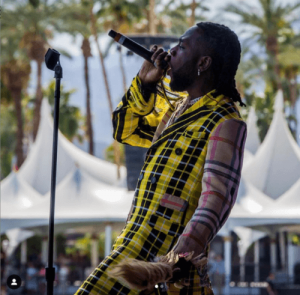 Burna Boy gave the watching audience at the 2019 Coachella festival a feel of how a performance from an “African Giant” looks like. The singer who was announced as a performer at Coachella 2019 in January stormed the stage all dressed like an African traditionalist with his band to deliver an energetic performance to the excited crowd. The singer spilled controversy earlier in the year when he was announced as a performer as he had issues with the organisers for writing his name on the line-up list in small blocks as compared to the other superstars who were written in bigger texts above him. It was this controversy that made Burna Boy adopt the name “African Giant” as he feels he is truly one.